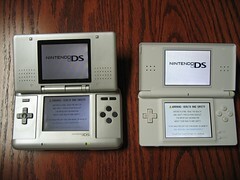 I somehow (mysteriously) found some brand new Nintendo DS Lites at a local store. Technically, they’re not supposed to be selling these yet since June 11 is the official release date. Being the true nerd that I am, I had to document the “unboxing” experience and contribute to Josh’s new unboxing.com site. You can see the full set of pictures taken by me over at Flickr. This entry was posted on Wednesday, May 31st, 2006 at 9:19 pm	and is filed under video games. You can follow any responses to this entry through the RSS 2.0 feed. Both comments and pings are currently closed.